More than 134 million Americans live near over 3,000 facilities that store hazardous chemicals, and those who live closest have much lower income and educational averages than those who live elsewhere, according to a report released today by a coalition of environmental justice groups. The report, called “Who’s in Danger? 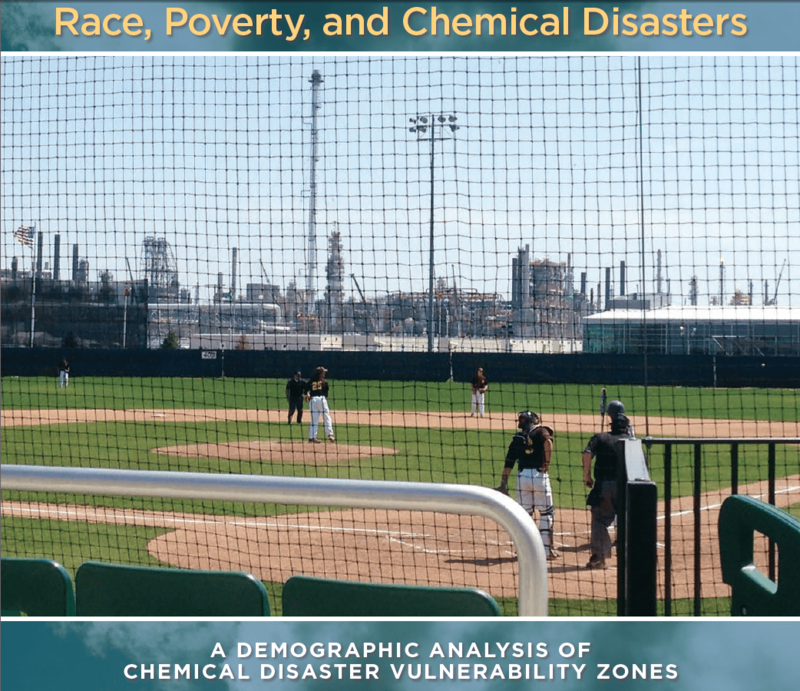 Race, Poverty, and Chemical Disasters,” sought to examine who lives in “fenceline” neighborhoods adjacent to large chemical plants. The report said those residents were more likely to be black or Latino and have lower home values, incomes and education levels than average Americans. It was prepared by the Environmental Justice and Health Alliance for Chemical Policy Reform, a coalition of local groups, as well as the Center for Effective Government and Coming Clean. 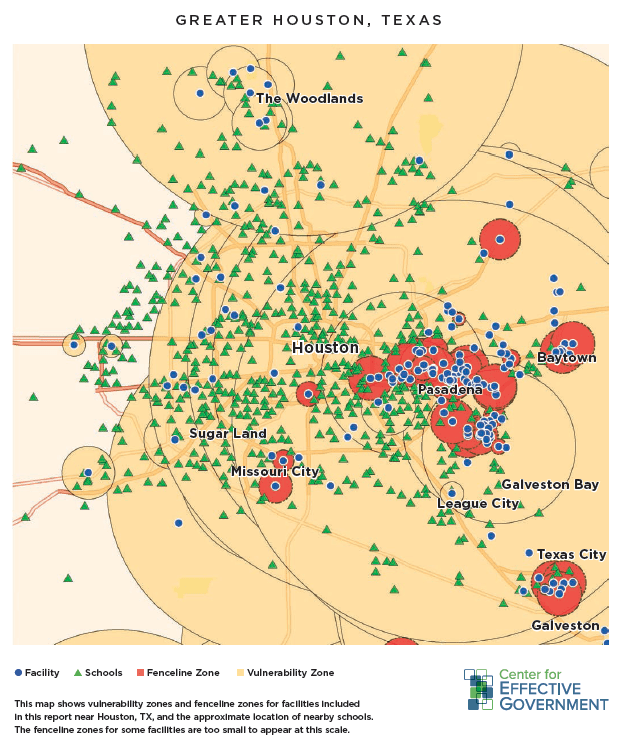 The groups examined 3,433 chemical facilities thought to use the most hazardous chemicals and accessed demographic data on surrounding communities from the U.S. Census Bureau to determine the neighborhoods’ home values, household incomes, races and ethnicities, education levels, and poverty rates. They found residents closest to high-risk chemical facilities saw home values 33 percent lower than the national average and average incomes 22 percent below the national average. The areas also contained a 75 percent greater African-American population than the average neighborhood and 60 percent greater Latino population, and had a poverty rate 50 percent above average. Requiring plants to assess their operations and identify safer chemical alternatives could reduce the risk to nearby residents, the groups said. “This report really is a continuation and a documentation of the fact that race and place are interrelated, and the fact that some communities are placed at greater risk than others,” said Robert Bullard, dean of the Barbara Jordan-Mickey Leland School of Public Affairs at Texas Southern University. The safety groups said that because they felt members of Congress were more interested in helping the chemical industry than in helping people, they would look to the Obama administration for new safety regulations, ideally through the president’s interagency group on chemical safety. The working group is expected to deliver its final chemical safety recommendations to the president by the end of the month, and advocates are hoping the panel pushes for using the Clean Air Act’s general duty clause to compel plants to evaluate whether they can use safer chemical processes to reduce risk. Industry groups have met with lawmakers in recent days urging the agencies to focus on using existing laws like the Emergency Planning and Community Right to Know Act to provide better information to local officials (E&E Daily, April 30). Richard Moore, a co-author of the report and the national coordinator of the Environmental Justice and Health Alliance, said the findings showed that struggling communities continue to be vulnerable to chemical disasters. Industry groups say they employ voluntary safety programs that have led to greater investments in plant safety, and they point to the Department of Homeland Security’s Chemical Facility Anti-Terrorism Standards program as another avenue to greater safety for communities. Moore said a pending bill to reauthorize the program promised only “Band-Aid approaches” to safety. Many of the groups are in Washington, D.C., this week to meet with elected officials, DHS and U.S. EPA. Moore said he tries to emphasize to public officials that new safeguards aren’t the impossible task portrayed by the chemical industry. This entry was posted in Activism, Difference: Class, Race, Gender, Disaster, Environment, Justice (EJ), Urban. Bookmark the permalink.